The rigorously selected woods have been dried naturally for 10 to 40 years. They are all superior quality tonewoods. Top : Swiss spruce, North American Englemann Spruce, Red Cedar. The Honduran mahogany necks are re-enforced by two carbon fiber bars for increased stability, rigidity, and a better vibrational balance between the top and the neck. This re-enforcement also allows for a more comfortable neck profile. The guitars are entirely French polished. The warm and deep reflective qualities of French polishing highlight the natural beauty of the woods without interfering with the vibration of the instrument. Alessi F2 tuning machines are equipped as standard, however other choices are also available as an option. The current waiting time is 12 months. A 20% deposit is required at the time of ordering. Composed of three types of wood with contrasting colors: Padauk, stained maple and stained pear wood. The mosaic central motif is bordered by a 0.3mm herringbone. The black and white veneers are very carefully thicknessed to 0.15mm. 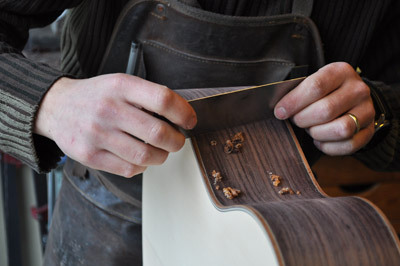 A total of 58 individual veneer strips are necessary to complete the finished rosette. 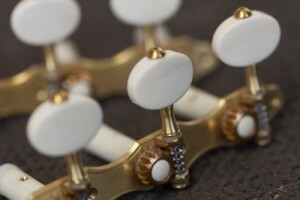 The care given to your instrument will have a big effect on its appearance, the sound, and its longevity. It is advisable to have your guitar checked every 2 years. 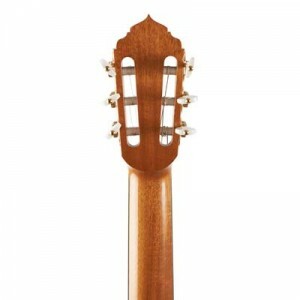 An acoustic guitar is made up of relatively thin panels of wood. It is because of this that the wood of an instrument vibrates at the plucking of a string. These thin panels also make the instrument sensitive to changes in humidity. As the wood loses moisture it contracts, as it absorbs moisture it swells. 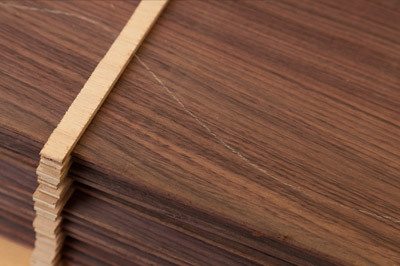 This expansion and contraction of the wood is the source of most of the problems a guitar is likely to encounter. To minimize the damage linked to relative humidity, the relative humidity of the workshop is kept stable between 40 and 45% with a temperature of 20 degrees Celsius. I recommend the use of a hygrometer and humidifier to control air humidity particularly in winter with the use of central heating and summer with air conditioning. The guitar will remain in perfect working order in conditions that are 5% below and up to 10-15% above those in which the instrument was made. French Polishing applied by hand is the ideal finish. Its thin coat and natural transparency highlight the quality of the instrument. It is also easily repaired which is a major factor in the longevity of the guitar. It is however a fragile finish and won’t protect your guitar against knocks. Avoid also direct contact with skin. The natural acids present on the of the surface of the skin can degrade the varnish. 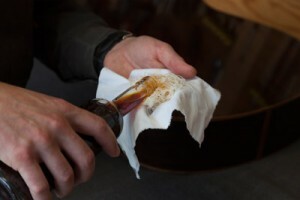 I advise a light cleaning of the guitar with a clean and soft white cotton cloth after playing. 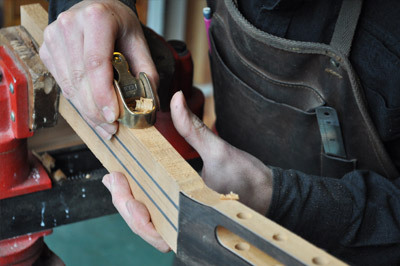 It is necessary to clean the fingerboard and protect the wood once a year. I recommend using carnauba wax. An unprotected fingerboard is at risk from cracks. The contact of the string on the fret will also wear down the metal over the years which is often compounded by a light deformation on the fingerboard (due to climatic variations). For optimal ease of playing and sound quality these problems can be rectified with a fret dressing and set up.